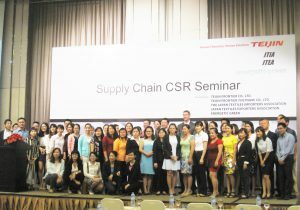 TOP > seminar > Thank you for coming to Supply Chain CSR seminar in Vietnam! 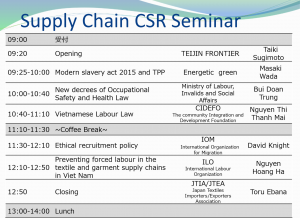 Thank you for coming to Supply Chain CSR seminar in Vietnam! 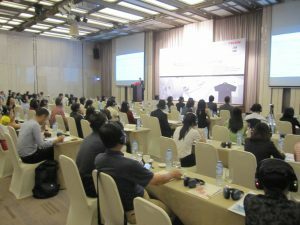 We held Supply Chain CSR seminar on August 24, 2016 in Ho Chi Minh City (Vietnam). More than 100 people participated, end it on a high note. We thank you for for this success. Mr. Masaki Wada from Energetic Green. They gave clear explanations about update of laes in Vietnam, labour issue which managers should care, global trend of CSR, etc. 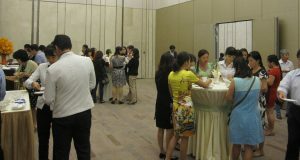 In the breaktime, companies’ managers and international organization’s members talked each other, which looked good opportunity for exchanges. Hope to hold again in the future.